How's baseball going for you this year? As we creep closer to the 2015 All-Star Game, I'm stalking the water cooler for trade deadline rumors and flashing back to that year Cliff Lee was a Seattle Mariner for...three months. To escape bad memories, check out this fine piece of prewar collecting history, an original mailing envelope and welcome letter for Goudey's Knot Hole League collectors club, complete with faux Lou Gehrig sig. If you were lucky enough in 1934 to have a candy store that stocked Goudey products and patient enough to save up their wrappers, you'd exchange them for a Knot Hole League membership kit, what we'd call today a loyalty program for their gum cards. This collectors club came on the heels of 1933, a huge year financially for both baseball and Goudey. Gehrig's business manager (Christy Walsh, "baseball's first agent") spun Larrapin' Lou's popularity into a splashy Knot Hole League President endorsement and likely ghost-wrote this welcome letter, though it could've been PR work from Goudey itself. Once in the club, you could trade further batches of Big League Gum wrappers for further promotional baseball goods. The 4 cards shown on that flier are catalogued for the hobby as 1934 R309-1 Goudey Premiums, all based around Babe Ruth and the hugely successful 1933 All-Star Game. This card's a store display version from the same promo. 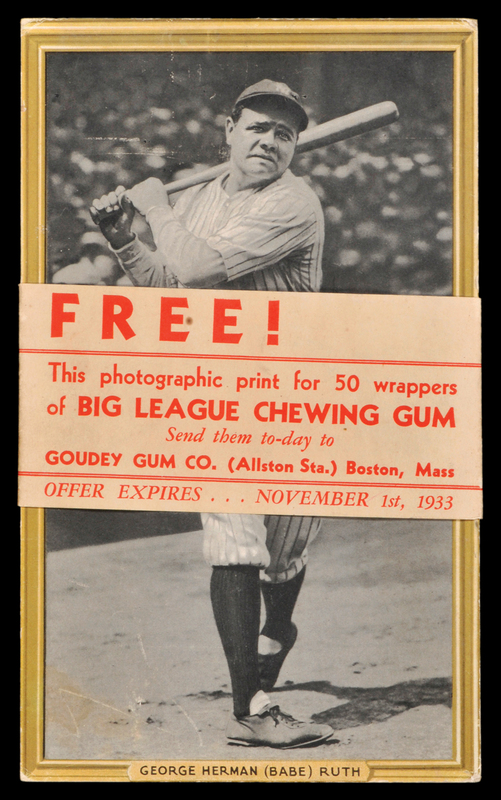 Babe's "November 1st, 1933" expiration date shows our catalogued 1934 date is a year off, as Goudey likely created these premiums immediately after the 1933 All-Star Game and used them to drive sales through the World Series. 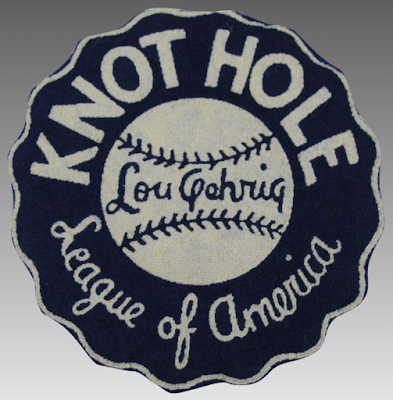 For 1934 (and beyond), they continued to offer remaining cards as a Knot Hole League mail-in offer. This labeled version sold for $1100+ at a 2012 Legendary Auction. I covered the Knot Hole League and its place in Goudey's history in this lengthy post, but today's membership kit adds some context to just how they approached new collectors with a personal touch. Getting something like that in the mail would've been exciting for any fan to pop open and pore over. 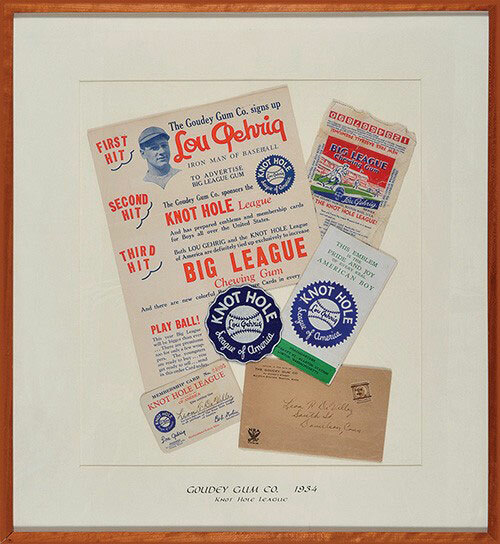 Very little Knot Hole League ephemera exists in any shape these days, so you'll need a little luck to snag something like Lou's letter or this framed membership kit, which sold for $533 in a 2014 Robert Edwards auction. Knock wood I can locate one of these badges at the 2015 National in Chicago! Yeah, would have to be extremely lucky to add a letter like that to my collection. The National is this week, though, so I'll post about anything especially cool that comes up! Did you have any luck at the 2015 National? I'm actually selling a Knot Hole League membership card and envelope on ebay (today is Jan. 2, 2017). I don't know if it is as rare without all the letters etc. Good luck with your collection.